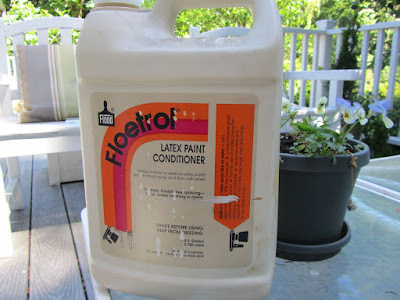 The other day, in the comments, YHF mentioned a product called Floetrol Latex Paint Conditioner. That jogged my memory to dig ours out. About 18 years ago, I was painting the upstairs bedrooms, and I bought this container of Floetrol for the trim paint. Floetrol's primary purpose is for paint-sprayers. You add a little bit to the paint going into the paint-sprayer, and it keeps the nozzle from clogging. It's beneficial in other painting applications, too. When I bought Floetrol, I did so for the trim work and doors. I was painting with a brush and wanted to minimize brush strokes. This product was recommended for satin and semi-gloss paint. You add a little to the paint and it lengthens the dry-time long enough for the paint to level out and reduce visible brush marks. Many claim that by adding Floetrol to your latex paint, it gives an oil-based paint appearance, but with a water-based paint. It also provides that extra bit of time to prevent lap marks when overlapping areas with brush or roller. And I've used it when I've been working with an open can for an entire day, just mixing in a couple of tablespoons, after about 3 or 4 hours, to keep the paint at a good consistency. YHF mentioned another use for Floetrol. She said that the professional painters sometimes use it in a small container for their brushes, while they paint. It keeps the paint from drying or thickening on the brush during a long day of painting, keeping the project flowing smoothly and extending the life of their brushes. So, I decided to give this a try. I had two brushes I was planning on using, for the trim around the French doors, applying two full coats and one additional partial coat on part of the trim that would need extra paint. 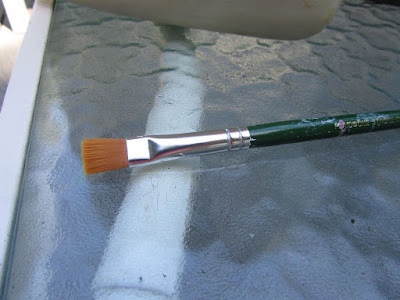 One of the brushes was a standard, 2-inch brush, the other a small craft brush, for getting into tight spots. I poured about 1/4 cup of Floetrol into a small glass cup, and that's where I kept my brushes all day, swapping out larger for smaller, as I needed. Between coats of paint, I just put a plastic bag over the cup and the open can. At the end of the day of painting, I had about 2 tablespoons of Floetrol (very infused with paint) left in the cup which I poured into my paint can, to condition the paint after a day of having the can open. (The maximum Floetrol to paint, shouldn't exceed a 1:4 ratio, no more than 1 quart Floetrol per every gallon of paint.) It worked well in keeping my brushes and paint in good condition all day. Floetrol is not cheap, at around $20-something per gallon. There's another brand, also used by professionals -- XIM Latex Extender and Leveling Additive that I believe is less expensive. However, it does keep for a long time. This container I've had is about 18 years old and still works as it did when I bought it. Because of its cost, I use it judiciously. But I think it's worth it, especially on interior trim, doors, cabinets and furniture, to get a professionally-finished look, but at a fraction of the cost. If you're a yard-saler, you might want to keep your eyes open for this product. It's the sort of thing that people cleaning out their garages might put up for sale. 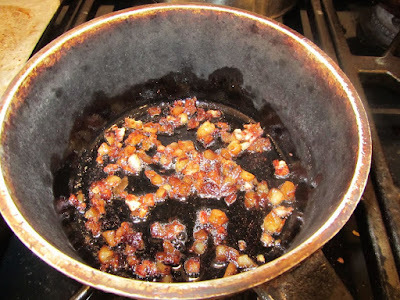 If you check the contents and see that it's still liquid, it's very likely that it's still in good condition, even if the container looks old. The other thing I wanted to share with you is the kind of craft brush that I use when house-painting. I have an assortment of craft brushes, for use with acrylic craft paints. A small flat brush works well when getting into those tight spots or up against another surface that I don't want to, or can't easily, tape off. On this project, I used the #10 flat brush to paint right up against the deck, the threshold of the door-frame, and the side edge of the trim against the door frame. This flat brush has short, stiff bristles, which help control where the paint is going, like using a felt pen. Indoors, I use it at the top of a room's walls, where walls meet ceiling. In the upstairs bedrooms, we have popcorn ceiling, still. You can't tape that surface. So, I use the craft brush to "draw" my top edge of the wall with paint. House painting is not my favorite task. But if I use some good tools, it makes the work easier and neater, and I finish up sooner. Lili, glad to hear that the Floetrol "trick" helped keep the paint from hardening on the brush during use. Like I said, I never tried it myself, but always thought the professional painters were on to a good idea. Not sure of this, but would the additive also extend the life of the paint in storage? The problem we had with storing latex paint was bacterial contamination, especially if water gets into the paint. So using Floetrol should help there too. Interesting to know that Floetrol has such a long shelf life. And love those square edged craft brushes for getting into tight corners. Thanks for the feedback, Lili, and can't wait to see your pics of the finished installation. Interesting about contamination of your paint. Our problem has been dried out paint. I was thrilled to find not only the siding paint in good condition, but the trim paint, too. We hadn't done any exterior painting since 2009. I'm thinking I may just do more of our house this summer, some of the walls which haven't been repainted since about 2000. It would be good to get it all done. I just won't go up on a ladder and do the upstairs, so may have to hire that out. I'll post photos later this week. 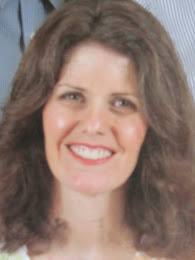 I have never used Floetrol but my husband knew all about it. I'll have to consider it the next time we paint. Some men just seem to know all of that hardware and home maintenance sort of stuff! I'll bet Ward is a handy type of guy. Well now, those brush strokes (and the lone, stuck bristle) are more like momentos, a lovely reminder of how your dad made the headboard for you!